Blown glass human organs encapsulate inert gases displaying different colours under the influence of an electric current. The human anatomy is a complex, biological system in which energy plays a vital role. Brain Wave conveys neurological processing activity as a kinetic and sensory, physical phenomena through its display of moving electric plasma. Optic Nerve shows a similar effect, more akin to the blood vessels of the eye and with a front ‘lens’ magnifying the movement and the intensity of light. 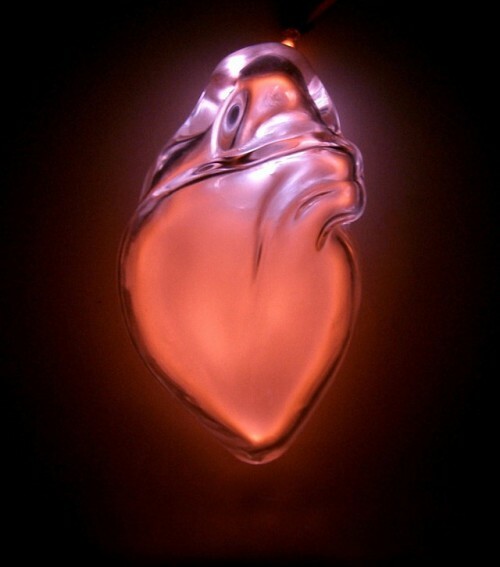 Heart is a representation of the human heart illuminated by still red neon gas. Electric Lungs is a more technically intricate structure with xenon gas spreading through its passage ways, communicating our human unawareness of the trace gases we inhale in our breathable atmosphere.